Are you the #lifesaver of the century? Between 2004 and 2009, aid from the European Union helped enrol more than 9 million children in primary education, vaccinate 5.5 million children against measles, and connect more than 31 million people to clean water. All this was achieved with a tiny part of the EU budget. Yet right now, EU aid is under threat. Europe’s leaders are in the midst of crucial budget negotiations over EU development assistance. Cuts proposed by some leaders to these life-saving programs—which only cost citizens €15 per year—would have a devastating impact on the world’s poorest people. We need your help to defend aid and help millions of people around the world. Today ONE is calling on everyone to tell EU leaders that they want to continue being a #lifesaver. 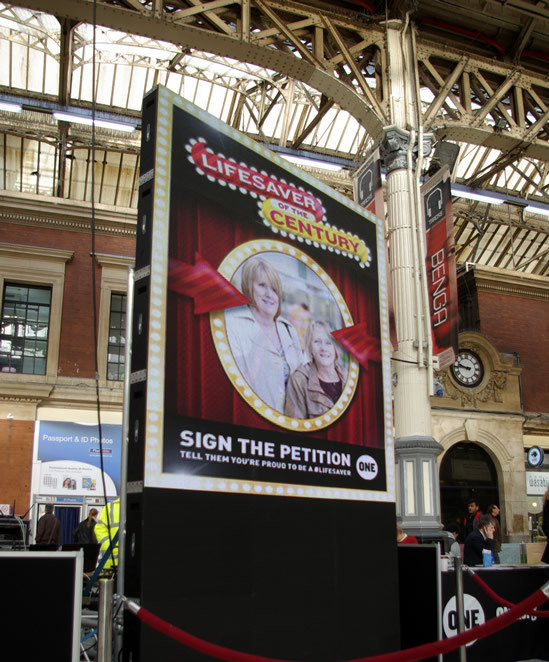 This week across some of Europe’s busiest places we’re launching a series of events that will beam the pictures of lifesavers like you onto gigantic jumbotron displays for the world to see! You can see it for yourself at Victoria station in London, Parvis de l’Hôtel de Ville in Paris and Whashingtonplatz in Berlin. If you can’t make it in person you can take part online and join our lifesaver campaign, by telling EU leaders you want to continue being a #lifesaver. You can follow the events online on twitter or on our facebook page.